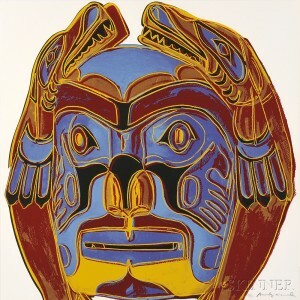 Collecting Trends: Modern and Contemporary Prints | Skinner Inc. Pop art takes its name from the integration of popular culture and art, and is most closely associated with the New York art scene starting in the late 1950s. Pop art itself was in part a subversive response to the dominant movement of the time: abstract expressionism. In the aftermath of World War II, the abstract expressionists had rejected traditional representational art as elitist. In their view, it required a sophisticated knowledge of history, religious iconography, and classical legends to understand most of the works in a museum. The pop art answer to this objection was to create representational art with a twist: works based on familiar, even mundane subjects accessible to everyone through the increasingly widespread mediums of print advertising, movies and television. Andy Warhol is the best known of the pop artists. His simple, linear style grew out of his work as an advertising illustrator. Quickly executed, bright and eye-catching, Warhol’s images of Campbell’s Soup cans and Marilyn Monroe are iconic, with prices to match. Less well known but equally infused with the pop art sensibility are his Cowboys and Indians series, portraying legendary figures such as Annie Oakley and John Wayne, and American Indian cultural objects. 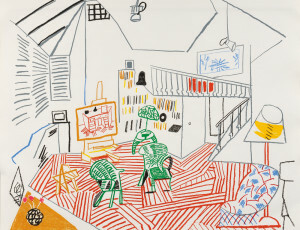 British artist David Hockney may deny that he fits in the pop art category. But he is nonetheless as eloquent in this genre as he is in the many other mediums and styles that he has embraced. Pembroke Studio Interior combines linear design and a narrow primary color palette with a spatial experience akin to the work of Picasso, whom Hockney greatly admires. The result is a depiction of familiar everyday subject matter with a strong pop sensibility. 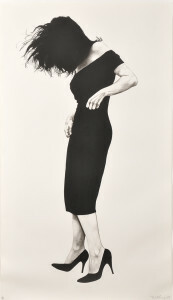 Another highly individual take on pop art is Robert Longo’s Gretchen, a large (67 by 39 inches) lithograph with a larger-than-life presence. Longo isn’t usually characterized as a pop artist, but he exudes a pop sensibility nonetheless. One influence on his work was his early obsession with popular mass media: television, movies, music, and magazines, a theme that was strong in the pop movement. Gretchen is based on an untitled drawing from his iconic Men in the Cities series. The series was created from images of people dodging projectiles thrown at them from a rooftop. The movements of his figures are raw, violent, and contorted. Certainly avoiding falling objects is self-preservation rather than popular culture. Still, the images read like choreography. These subjects can’t help but evoke figures at a late night dance club; think New York’s Studio 54, a favorite of pop art’s celebrity patrons and subjects. Longo was in an art-punk band in the late 1970s, and created a number of album covers as well as several music videos in the 1980s. The visual connection to dance cannot have been lost on him. This lot sold well above its pre-sale estimate of $5,000-7,000. Why the highly competitive bidding? It’s all about the iconic. When someone says “Robert Longo,” edgy and high-impact works like Gretchen instantly spring to mind. That’s the prefect formula for success in the current market. View current offerings of Modern and Contemporary Prints in our September 11th Fine Prints & Photographs auction. This entry was posted in Blog and tagged American art, Andy Warhol, Claes Oldenburg, Contemporary Art, contemporary artists, David Hockney, european art, fine art, Fine Paintings, Fine Prints, fine sculpture, Jeff Koons, modern art, Photography, pop art, Robert Rauschenberg, Roy Lichtenstein by Robin Starr. Bookmark the permalink.